A new Brooklyn bed and breakfast perfectly captures the current Southwest-meets-reclaimed industrial design zetigeist, with great snacks to boot. With the exception of the massive, perpetually packed Wythe Hotel, Williamsburg has long been a ghost town when it comes to stylish hotel rooms. Now a new bed and breakfast has sprung up in residential East Williamsburg that perfectly captures the current Southwest-meets-reclaimed industrial design zetigeist, with great snacks to boot. Called Urban Cowboy, the five-room inn is the passion project of Lyon Porter, a real estate developer who originally set out to convert the property into his home, but changed his mind after visiting Maderas Village, a low-key, community hangout and hostel in Nicaragua. Porter and interior designer Renee Mee have converted an otherwise non-descript townhouse into an urban oasis that looks like the home of somebody's incredibly cool aunt in Santa Fe, complete with a separate cabin out back (next to the woodchopping station) that comes with its own wood-burning stove and clawfoot tub. The first floor is one huge open space, a combination living room and subway-tiled kitchen with massive garage doors on either end, which are left open on nice days. Upstairs, minimalist rooms feature beautiful exposed ceiling beams and have names like "Vision Quest" and the "Lion Master's Den." 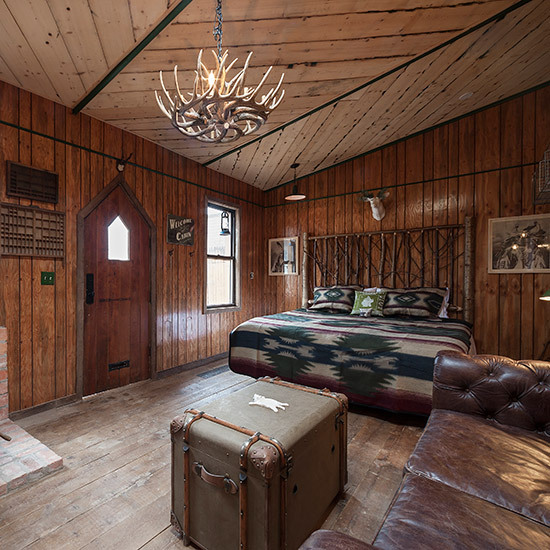 Dreamcatchers, Southwestern-print blankets and a chandelier composed of antlers are a given. A massive pine tree covers most of the entrance, but a defunct light-up road sign shaped like an arrow pointing towards the entrance is a dead giveaway that this isn't another Italian-American nonna's house.